Retiree receives a pension from a former employer, is on Medicare, and has self-employed income. The 1040, line 29, allows a health insurance deduction with this exception: Amounts for any month you were eligible to participate in a health plan subsidized by an employer. Retiree's paystubs show monthly deductions for health insurance. No indication on the paystubs of any employer contribution. On the 1099-R, Box 5 is blank (see image and notes about image). 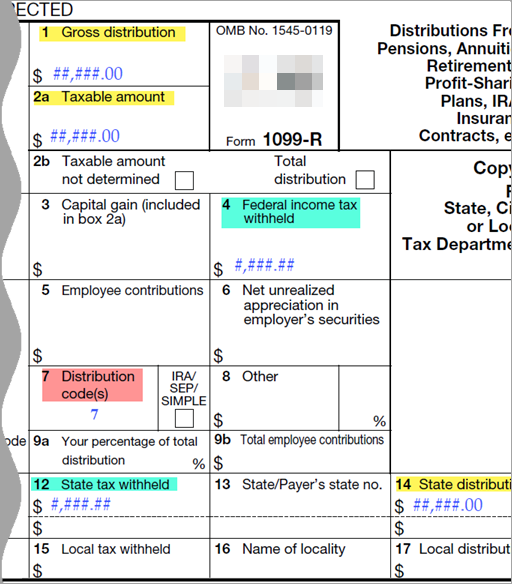 Boxes 1, 2a, and 14 match the gross annual income indicated on the pay stubs. Boxes 4 and 12 show taxes withheld at 20% more than needed (over withholding). Box 5 is empty. As I understand it, this is where any subsidized health insurance amount would appear, per the 1099-R instructions "Generally, this shows the employee’s investment in the contract (after-tax contributions), if any, recovered tax free this year"
Box 7 has the code 7; the code means "Normal distribution," which I assume means there were no adjustments to the gross annual income. Employer-sponsored plans may be constructed so that both employer and retiree pay a share of the premium. Premiums that are deducted from a retiree's taxable income can be deducted (subject, of course, to meeting the requirements for the deduction). The NY Times article is a bit confusing because it has a poor referent ("those") in this excerpt (my emphasis on "those"): But economists on the left and the right argue that to really rein in health costs, Congress should scale back or eliminate the tax exclusion on what employers pay toward employees’ health insurance premiums. Under current law, those premiums are not subject to the payroll or income taxes that are taken out of employees’ wages, an arrangement that vastly benefits middle- and upper-income people. In this case, "those" refers only to the share of the premium paid by the employer. Not the answer you're looking for? Browse other questions tagged united-states income-tax tax-deduction self-employment form-1040 or ask your own question. Should I report my S-corp dividends on my 1040 as sched-C self-employment or 1099-div?